The film stars “Animal Kingdom” alum Guy Pearce as Eric, a loner roaming the desolate Australian outback where law enforcement is hard to come by and everything comes at a hefty price. When a group of criminals steals Eric’s car in the heat of a botched heist, he decides to pick up the wounded accomplice (Robert Pattinson) they leave behind so he track them down and get back his sole remaining possession. When you mark your feature debut with something like “Animal Kingdom,” follow-up opportunities are bound to come your way. However, an opportunity and the right opportunity are two different things, so Michôd opted to take his time to ensure he picked the best thing. It’s been nearly ten years since we’ve seen Mick Taylor mutilate unsuspecting victims in “Wolf Creek,” but now he’s back and eager to torment a new crop of tourists. This time around the narrative centers on Paul Hammersmith (Ryan Corr). While driving down a highway in South Australia, he unknowingly attempts to help one of Mick’s many victims and, as one might expect, Mick doesn’t appreciate it so makes Paul his next target. Paul’s a bright guy with a lot of resolve, but that might not be enough to outrun Mick and his enormous arsenal right in his own backyard. 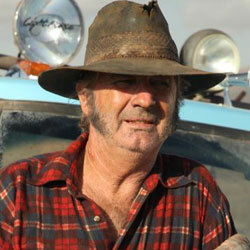 With “Wolf Creek 2” making its US theatrical debut today, ShockYa had the pleasure of talking head-butting, spine-cutting and loads more with Mick Taylor himself, John Jarratt. Check out what Jarratt told us about getting “Wolf Creek 2” off the ground, the indelible impression he made on one fan, how much of the narrative really is “inspired by true events,” and more in the interview below. Nick Frost leads Cuban Fury as Bruce. Way back when, young Bruce was a rising salsa star. He proudly strut around in his bejeweled shirts and pristine dancing shoes, collecting trophies and titles left and right – that is until a group of bullies showed Bruce what they thought of his hobby. Years later, Bruce’s dancing shoes are collecting dust and he’s spending his days working safe and sound at a desk job. However, when he finds out his beautiful new boss, Rashida Jones’ Julia, has a little thing for salsa herself, his little thing for her inspires him to give dancing another go. 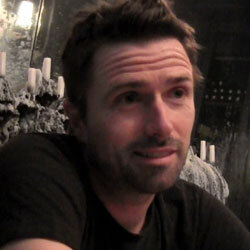 You know Pat Healy, right? Well, if you don’t, that means you probably haven’t seen “The Great World of Sound,” “The Innkeepers,” or “Compliance,” and that also means you have quite a bit of movie watching to do. But before you get to any of that, Healy’s latest feature is an absolute must. 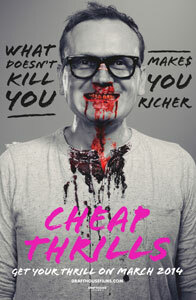 In fact, “Cheap Thrills” is easily the best film I caught on the film festival circuit in 2013. 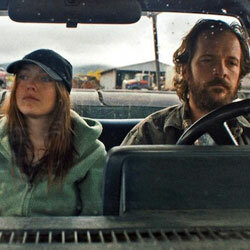 Healy leads as Craig, a loving husband and father who gets slapped with an eviction notice and loses his job all in the same day. In an effort to ease the pain, Craig hits the bar and that’s where he happens to bump into an old high school friend, Vince (Ethan Embry). A few drinks in, they’re joined by another couple Colin and Violet (David Koechner and Sara Paxton). Colin doesn’t just enjoy sharing a little of his wealth by buying Craig and Vince drinks; he wants to share a significant amount of it in exchange for dares. At first, it’s simple things like being the first to take a shot and antagonizing a bouncer, but the higher the payout, the more intense the dare, and with his home and family on the line, Craig proves to be quite the contender. Meet Ansel Elgort. You better get to know him now because he’s bound to make quite the name for himself over the course of the year. Maybe you saw him in the Carrie remake, but Divergent is another story. With a sequel already planned and good buzz fueling its momentum, this will most likely become the next big YA franchise. And if we learned anything from Twilight, Harry Potter and Hunger Games, that will skyrocket its cast members to a new level of fame. 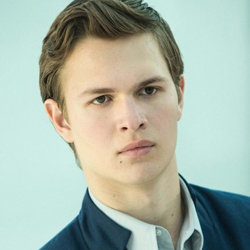 In the film, Elgort plays Caleb Prior, Beatrice’s (Shailene Woodley) older brother, but not by much. Now that they’re both 16, they’re due to take aptitude tests before participating in what’s called the Choosing Ceremony, which is where they decide whether to stick with their parents in Abnegation or switch to one of four separate factions: Dauntless, Erudite, Amity or Candor. Caleb does have a knack for being selfless, but what if his test told him he was a natural fit for a life of bravery, intelligence, peace or honesty?